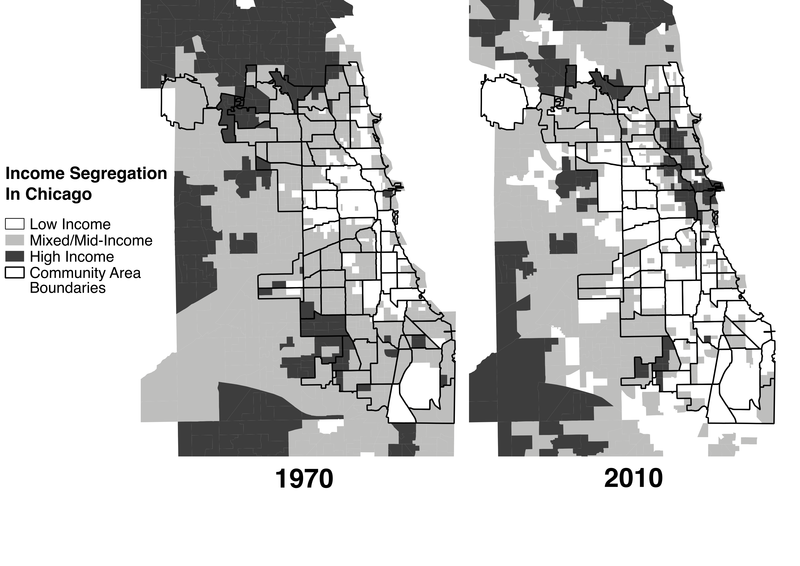 Some maps of mine are in the print edition of the Sun-Times, accompanying an op-ed by the Metropolitan Planning Council‘s Marisa Novara. 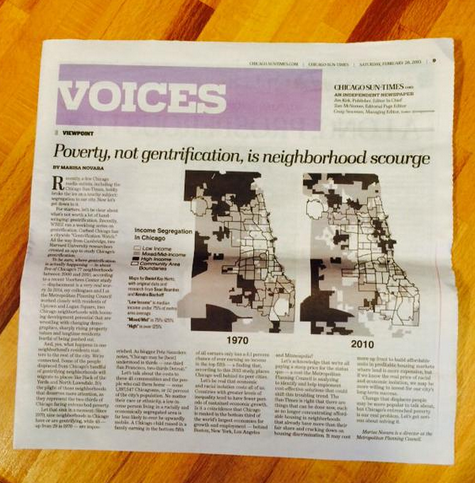 The piece is called “Poverty, not gentrification, is Chicago neighborhood scourge,” and it argues…well, you know. But it’s worth reading the whole thing! The maps themselves are simplified, grayscale versions of these. But since the Sun-Times didn’t include them in the online version of the article, I thought I’d post them here, in case anyone was curious. I don’t know if Chicago is different in this regard, but with Toronto, looking at average income can be a bit misleading. For instance, within the city of Toronto, the parts of the city with the biggest middle class are in the northwest and northeast of the city – the parts of the city with the lowest average incomes. 1. Very wealthy areas with few people in other income brackets, ex Lawrence Park, Forest Hill, Princess Anne Manor, Oakville. Typically single family neighbourhoods, typically with large homes. If there are people from lower income brackets, they probably live in a small number of apartment buildings or non-market housing, but there’s not much of those. 2. Neighbourhoods with a mix of wealthy and poor, but a small middle class. Typically centrally located neighbourhoods that are valued by the wealthy for this reason, but also have either a lot of older apartment buildings or non-market rate housing. Wealthier residents are often childless or sending kids to private school. Example – Cabbagetown, Palmerston, Harbord Village, The Annex. 3. Yuppy neighbourhoods, the income of these depends on how you measure income (per capita or per household) since households are small, but per capita it can be reasonably high. Typically downtown on around subway stations with mostly apartment buildings and condos like Yonge and Eglinton. You might have some lower incomes mixed in. 4. Aging suburbs, big lower income population, average middle class population. There’s often a lot of aging apartment buildings, with a lot of recent immigrants and service class workers, and sometimes non-market rate housing as well. Much of the high paying jobs are downtown, so this is not a very good location if you’re wealthy or upper middle class with the mediocre/bad commute and having to live near poor people. However, if you’re middle to lower-middle class and work in the suburbs, the affordability of single family homes and reasonable commutes might make up for having to live near poor people. Also, you might have immigrants that want to stay near their ethnic enclave by living in a single family home near the high immigrant apartment buildings. Examples would be L’Amoreaux, Downsview and Rexdale. 5. Middle class outer suburbs. Typically mediocre location and cheaper but often relatively new tract housing. Often have few people working downtown, and consequently few wealthy people. Often also have relatively little aging apartment buildings or non-market housing though, so relatively few poor people too. That leaves a population that ranges from blue-collar lower-middle class to white-collar upper-middle class. Best example would be Brampton. 6. Upper middle class outer suburbs. Similar to middle class outer suburbs, but skewing a bit wealthier, often due to either better location, like near commuter rail in the case of Pickering or Whitby or fancier houses, like in the case of Vaughan. 2 and 3 might have an average income that is “middle class” despite having a small middle class, especially if we’re talking middle class families. 4 and 6 might have a decent sized middle class but the average is going to be either low or high due to having lots of poor and few wealthy or lots of wealthy and few poor respectively. That’s a good point, and I’m not really sure. It would be worth making separate maps that show the percentage of people in certain income brackets, rather than just median income overall.